More and more Australians are becoming aware of the huge benefits of installing hydronic heating systems in their homes. Hydronic heating or radiant heating uses a closed loop system, creating little heat loss while moving the heated water beneath the floor, along base board heaters, or through radiators to heat your home. A hydronic radiant system provides added comfort and control in heating zones, savings through lower heating bills, and a decrease in the environmental impact. The Europeans have been using hydronic heating for centuries as it is by far the most efficient heating system. A good website is www.hydronicheating.net which explains how the system works in detail and below some of the benefits the site outlines, summarised. The hot water of the hydronic radiant heat system is circulated throughout the home through loops of plastic piping. Most often, these tubes are installed within your homes concrete slab or floor joist system as radiant flooring, and allow the heat to radiate evenly across the entire floor surface. 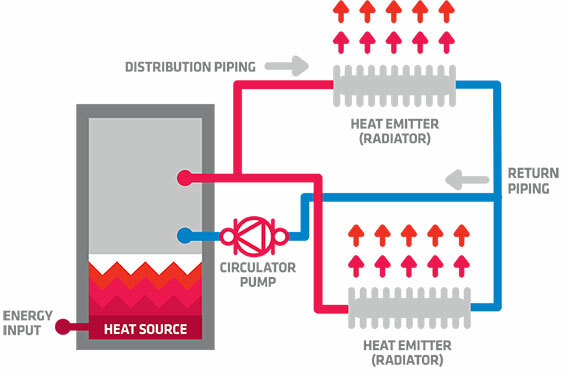 In addition, other heating units like radiators can be used as sources of hydronic heat. Hydronic systems are not the only means of radiant heat. Electric heated floors are an alternative method of radiant heating that can be suitable in some residential heating designs. Floors that are heated electrically are not usually used as a whole house heating system, instead electric radiant flooring is used as a secondary system to focus on specific areas of the home for example mainly in bathrooms or living areas. Typical installation is done by rolling out a thin layer of matting or mesh that contains the low voltage electric heating coils laid out in a pattern similar to hydronic radiant tubes. Obviously every project is different and an informed decision is required so that the best solution is installed. Generally hydronic heating is installed within new concrete slabs so more often than not in new homes vs renovations. Forced air systems (air-conditioning) use a furnace or heat pump to heat the air and then disperse it through the house via ductwork and in-room vents. This system can provide heating and cooling which make them popular especially in the hotter areas of Australia. Forced Air – A benefit to forced air is that it has the ability to quickly raise temperatures, whereas hydronic heating can be slow with temperature changes due to the use of thermal mass. Hydronic – On most other comfort issues, radiant heat is far superior. Examples of this include the fact that radiant heating heats the entire room evenly, while keeping tile floor warm to walk upon, and not drying out the air. In addition, forced air can be loud when the heat turns on and off, while hydronic heat works silently in the background. Another popular hydronic system is Geothermal heating and cooling. A couple of metres below ground, temperatures remain relatively constant year-round. 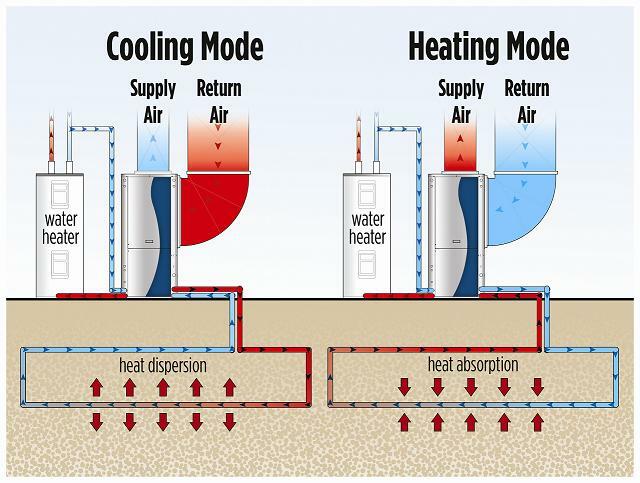 A geothermal system is a central heating and/or cooling system that transfers heat to or from the ground using an indoor handling unit and a buried system of pipes called an earth-loop. It uses the earth as a heat source (in the winter) or a heat sink (in the summer) providing ‘free’ energy to the house. Our Block House in Pearl Beach uses geothermal heating/cooling for a comfortable year round temperature. The house also adheres to numerous sustainable design principles, including passive cooling and heating, external timber shutters, sub-floor ventilation, rainwater harvesting, solar panels and thoughtfully placed skylights. 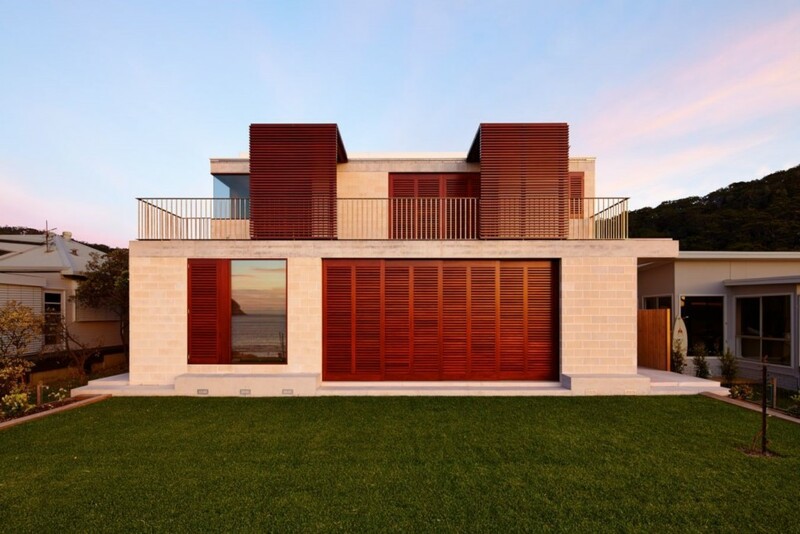 The operable timber shutters and low-e double glazing provide protection from fluctuating external conditions, and work in unison with thermally massed materials to deal with high diurnal temperature ranges.